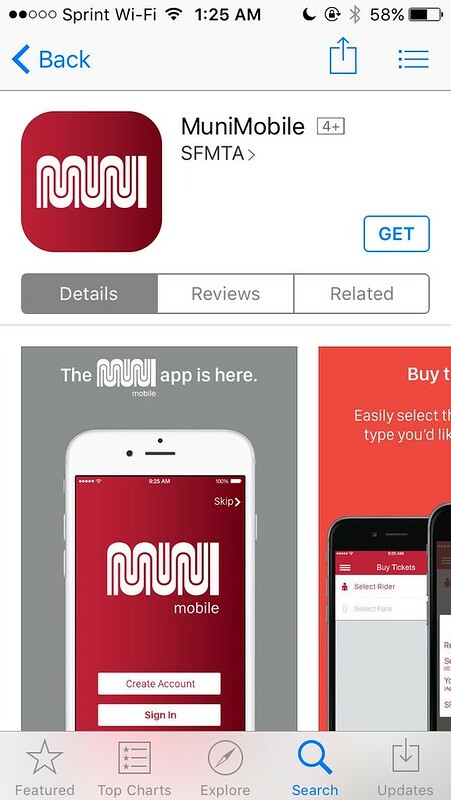 Contrary to the news media saying next week Monday, the MuniMobile fare payment app is now available for download on the iTunes App store for everyone to use. If you have an iOS phone, go to the App Store and search for "MuniMobile." If you are on a computer, click here to go to Apple's iTunes Preview site to read about the application. Since I don't own an Android, I can't verify if it's available. As I was a beta tester, I was able to play around with the app and I did buy a couple of single ride fares to try it out. I didn't encounter any fare inspectors, but all the bus drivers knew what it was and let me through without asking any questions. 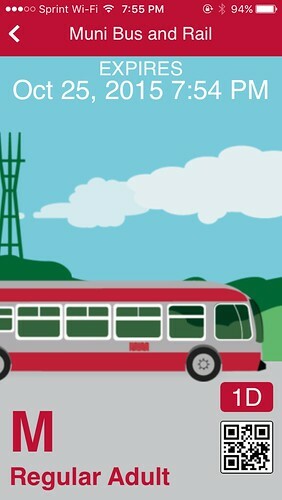 The only real odd thing about the app is the Muni logo is backwards when the animated bus passes by from the left to right; the MuniMobile ads posted on the buses show the bus going the other direction with the logo facing correctly. 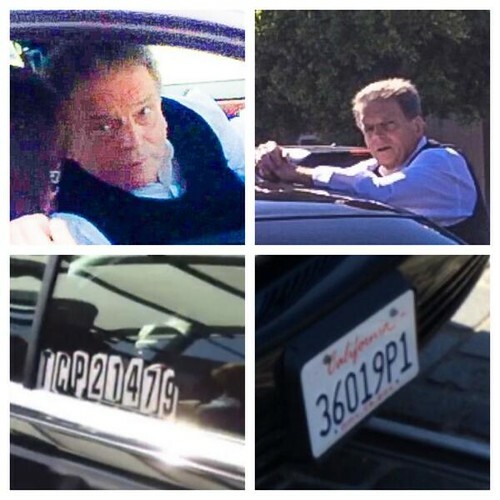 To learn more about my experiences with the MuniMobile application, visit my other blog entry. Lastly, if you want a personal recommendation, stick to your Clipper Card; it's the only method to get inter-agency transfer discounts or free Muni rides from Daly City BART. 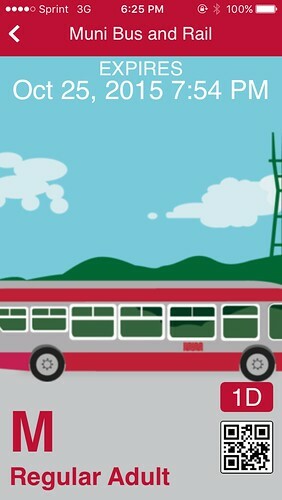 MuniMobile is better for tourists (especially the Passports on sale), people who rarely ride Muni or wants to pay for their rides with a credit card, and as a backup fare option if you run out of Clipper Card money. Clipper Card on iPhone's Apple Pay Service - Could it Really Happen? Greetings readers, it's been a while since I've blogged. I'm still happy and well, but I've been sticking to my public social media accounts on Twitter and Instagram more often. I thought I'd write a blog entry today because of what's been happening in the news for the past week. The announcement of the next generation of iPhones, in particular Apple Pay, is really attracting a lot of news these days as the next cool way for people to pay for stuff at their favorite big retailers without pulling out their plastic credit card. And while the Android platform has been using their NFC chips for a good while to be able to pay with credit cards and read NFC tags, with Apple playing along, that puts a huge chunk of the smartphone market able to now use NFC technology. But what really intrigues me about the big evolution of NFC to be capable on Apple devices is the opportunity for public transportation to play a role in being a part of it. 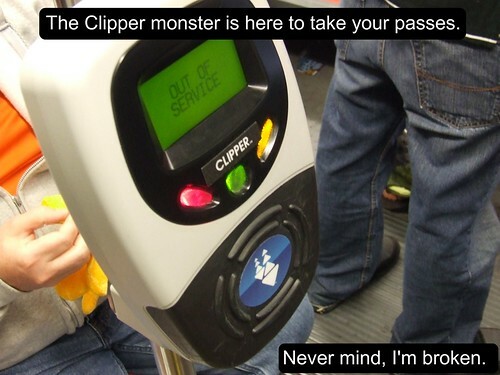 Simply put, will the Clipper Card be an option for Apple Pay and Android? No more carrying a plastic Clipper Card in your wallet. Just put your phone to the reader to handle your fare/pass transaction. Be able to instantly view your card's balance, transfers with the time it expires, and your passes. Be able to instantly view your ride history, and have instant proof of payment on hand for fare inspectors. Using the Clipper Card app, be able to add card value or buy passes using a linked credit card with instant available use, without the horrible five day waiting period currently in use for people who buy online for their plastic card. Read about the five day rule here. 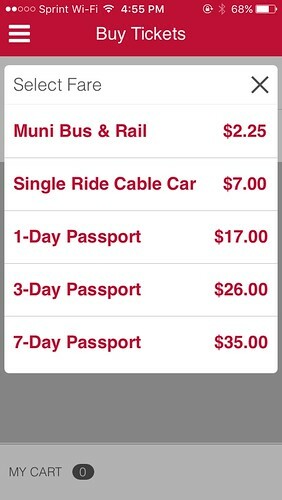 Also, using the Clipper Card app, people can also purchase day passes like for Muni. Muni does sell the passports for Clipper, but people still prefer the scratch-off ones or buying it from the Cable Car conductor. Also, there could be an option for people to not use a Clipper Card, and instead use a registered credit/debit card to make their one-time transit fare payment. It might be a cool perk for those with pre-tax commuter benefit debit cards to simply tap their phone and just deduct the balance from the card; no more need to load the money to a Clipper card, just touch and pay. It may not be possible to have Clipper do this. The Clipper Card system itself was one of the first smartcard systems ever in the United States, and as of today, the system is outdated when compared to other agencies using smartcards. When Clipper first started, it started as the TransLink card program which the MTC awarded a contract to ERG, a leader in smartcard technology for transit systems. But many years later, Cubic, a titan in the transit technology market, bought out ERG and took over its contracts, including TransLink/Clipper. The folks at Cubic had an uphill battle to get their products to properly function with the thousands of ERG cards and technology in use, such as the BART and Muni fare gates (Cubic products). Cubic had to take the right route, they couldn't remove the ERG products already wired and installed and start from scratch (that would cost a ton of money), so they made a hybrid system so both ERG products and Cubic products work together. Since the Clipper system is outdated, it may not be able to take mobile phone payments. If the above is true, we may have to wait until 2019-2020 for the next generation of Clipper Card technology to have the features. The expected end of life for the currently installed technology is to end roughly around 2019 and that's when the contract with Cubic is to expire. The Metropolitan Transportation Commission intends to put in the next generation of Clipper by starting from absolute scratch, instead of preserving the old infrastructure. A simple way of thinking is, the MTC may be able to save money by delaying smart phone implementation until the 2nd generation system is functional. Click here to read about the second generation of Clipper plans. In my opinion, I wish the Clipper Card was available as a smartphone function to just tap the phone to a card reader to ride public transit, or even just allowing people to use a linked credit card to just tap and pay for their rides would be wonderful. Also, with the ability to order passes or load more cash value from your phone means your virtual card on your phone will have instant available use of your pass or funds, without the terrifying five day waiting period or running to your Walgreens or train station to load-up. But looking at all of the cons, this may be something the MTC may not want to pursue, especially if the Clipper Card program is to be in a coffin by 2019 and a new program will be functional by then. The technology being used today is outdated but functions as expected. 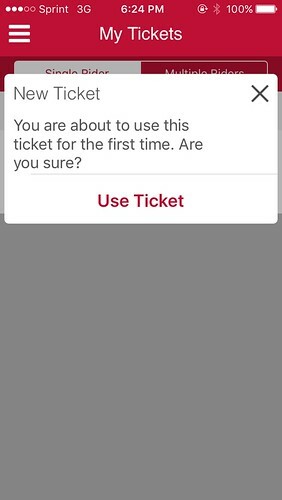 I feel this may be an opportunity for Clipper to work with Apple and Google to allow Clipper card users to get an app that utilizes a plastic Clipper card and an NFC capable phone to let people scan their card to read their ride history and review their balances on their card (currently, the FareBot 3rd party app for Android can do this). This may also be an opportunity for people to order their passes, add cash value, etc. on their phone, and tag their card to their phone to update the card's data with the new information so people can instantly use the card with the new information. What's your thoughts on this? Leave a comment. If you use your Clipper card to transfer from a San Francisco BART station to a Muni vehicle or metro, there's a change in policy regarding the transfer rule. When exiting BART from any station between Embarcadero and Balboa Park, you have one hour to transfer to Muni. When tagging the same card you exited with BART and use it on Muni, you get a 25 cent discount on your Muni ride. 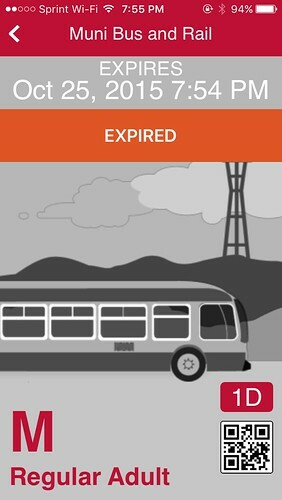 When you are ready to take your next ride on Muni (after the Muni 90 minute transfer expires and its less than 24 hours from the time you exited BART), your next Muni fare transaction is 25 cents off. 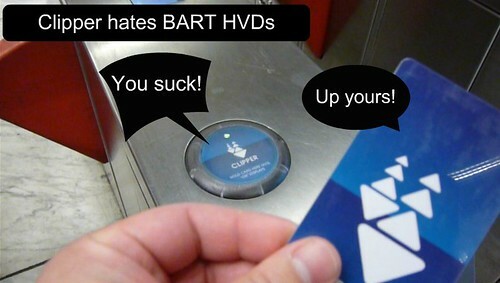 This is the exact policy just like when BART stations issued paper discount transfers which gave the same benefit. When exiting BART from any station between Embarcadero and Balboa Park, you have one hour to transfer to Muni. When tagging the same card you exited with BART and use it on Muni, you get a 50 cent discount. There is no discount for a second ride. 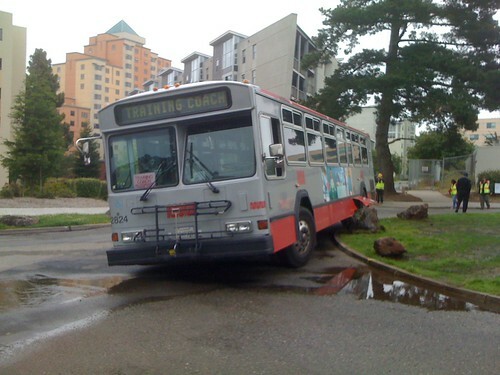 Note: This policy is not valid if you have a Muni monthly pass. It must pay in Clipper e-cash funds. As always, if you have a Muni monthly pass on your card, Clipper always seeks the best deal, instead of yanking $1.50 out of your pool of funds. Also, this policy is not in use at the Daly City BART station. Passengers still get a free ride on any Muni line that serves Daly City BART. How did I notice the change? When I go to baseball games at AT&T Park, I have to take BART and Muni metro to and from the park. I noticed when I tagged my card on the Clipper card reader to get back after the game, I had to pay full fare. When I got home, I reviewed my Clipper card records online and found out that there was that change in transfer policy. It's a simple change that makes it more simplified for Clipper card users. Instead of wondering if the return ride 25 cent discount works, you just get the full 50 cents off in the first Muni ride away from BART. I like it.